The Name List can be displayed in either Surname/Given Name order, Given Name/Surname order or by RIN numbers. Press the #, First or Last button at the top of the window, or click in the text box to the right of each button. If the list is long, you can search for an individual in the list by typing their name, starting with the given names or surname or by entering their RIN number. As you type, Legacy automatically jumps to the nearest matching name in the list. You can jump to the first name beginning with any letter by pressing the letter buttons above the grid. You can also jump to the beginning or end of the list by pressing the First and Last buttons. To select an individual from the list, highlight the name and press the Select button, or double-click the name in the grid. � Delete Individual Select this option to delete the current individual from the family file. 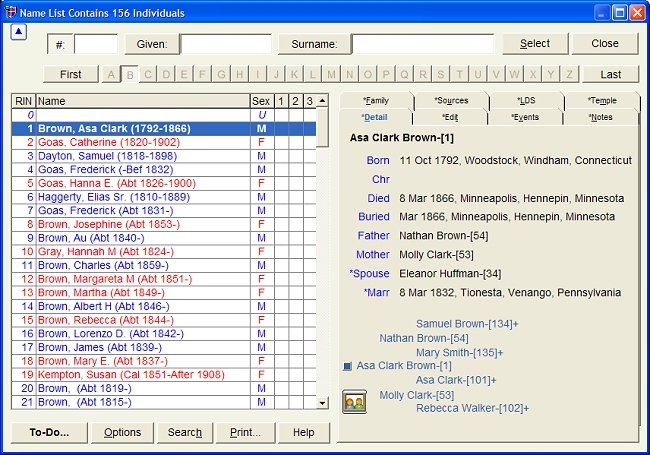 Before the person is actually removed, a Delete window appears showing any parents, siblings, spouses and children that are currently link to the individual. This is to insure that you know what you are doing. If you really do want to delete the person, press Yes. If you have changed your mind and want to back out, press Cancel. � Show All Tagged You can choose to limit the Name List contents to just those individuals who are tagged on a certain tag number. Choose 1, 2 or 3, etc. � Show All Untagged You can also display only individuals who are untagged on a certain tag number. Again, choose 1, 2 or 3, etc. � Set Bookmark Sets a bookmark on the currently highlighted person. Pops up a list of all the people you have bookmarks set on. Highlight the person you want to jump to and press Go To. � Zoom You can increase or decrease the type size on the Name List, Tab List or Notes. Larger font sizes are easier to read. Smaller sizes display more information.